Expected symptoms: Minor stinging or burning sensation of mouth and skin. What to do: Give your child a drink of water to wash the glow liquid down to the stomach. Wash exposed skin with soap and water. Note: If your child has gotten glow liquid into their eyes, call the Missouri Poison Center now for help on how to rinse the eyes. Children love glow jewelry because of the bright colors and the magical way they light up. They come in all shapes and sizes and are filled with liquid that glows a variety of fluorescent colors. Kids tend to chew on their glow jewelry and bend them as they are playing with them. Parents and kids alike are surprised when they break open in their hands and mouth. The ingredients inside the glow jewelry are considered relatively nontoxic, and the small amount of fluid in each tube adds to its safety. They contain a substance called dibutyl phthalate, which is a clear, oily, colorless to pale yellow liquid. This liquid can cause a stinging or burning sensation of the mouth or skin that comes in contact with it. 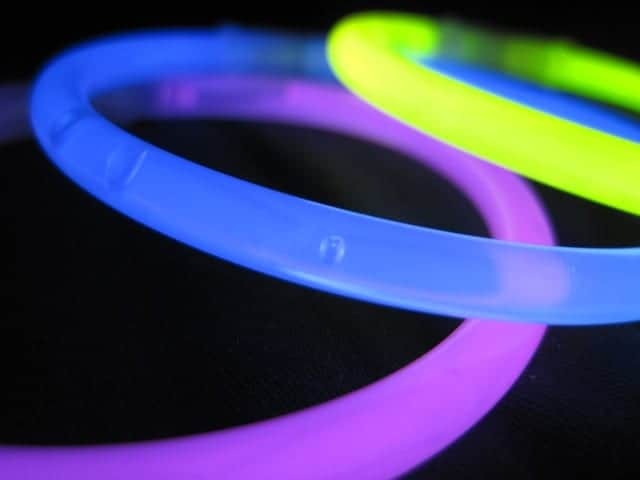 If a glow stick breaks open while your child is playing with it, do not panic. Take it away from your child, wipe off any visible product from their hands, and then wash the exposed skin with soap and water. If your child has some of the liquid in their mouth, wipe it out with a wet wash cloth and give them a drink of water. The stinging or burning sensation should resolve quickly but a little snack such as a popsicle, ice cream, or yogurt can also help. Don’t be surprised if the exposed area continues to glow for a few minutes. If the glow liquid gets into the eye, call the Missouri Poison Center now for help on how to rinse the eyes. If problems start or you have questions, call right away at 1-800-222-1222. The poison center is open all day, every day for poisoning emergencies and questions, too.